The evil genius behind a new cookie vendor is Sarah Masters Phillips, sous chef at Highlands Kitchen. 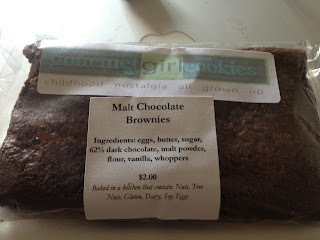 With a penchant for baking, particularly cookies and other comforting desserts (see my post about how she taught me to make scones), she wanted a way to share her passion with others and came up with Gourmet Girl Cookies. Her mooliciously addictive treats are currently available Wednesday nights at the Southwest Farmers Market, as well as bake to order. Most of the treats are based on childhood or nostalgic treats with a grown up twist. Including a variety of chocolate chip cookies, one with bacon fat to give it a richer mouth feel with a smoky bacon taste – see her talk more about them on CTV Edmonton Morning Live. Or one mixed with potato chips for the perfect balance of salty and sweet. She also makes other items such as incredibly soft, melt in your mouth chocolate brownies with crunchy malt chocolate pieces, giving the brownie contrasting textures. As well as a version of S’mores consisting of a crumbly graham cracker crumb surrounding soft marshmallow filling and oozy chocolate. The treats that are available vary from week to week, with her creative mind whipping up new and deviously delicious desserts all the time. 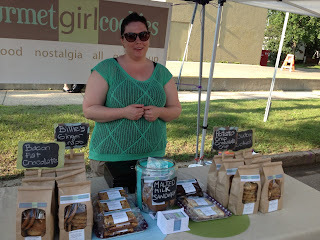 Follow her on Twitter to find out prior to Wednesday evening's Southwest Farmers Market what she has available for sale. She can also be found on August 2 and 9, 2012 at the 124 Street Grand Market. I can't believe I'm yet to eat these amazing cookies that everybody is talking about. Hope I find time this Thursday! I hope you make a trek out to 124 Grand Market tomorrow and snag some! 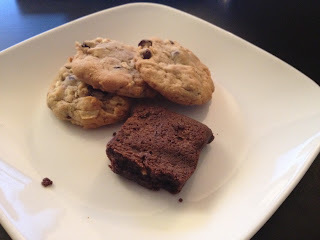 I think my favorites so far are the potato chip and chocolate chip cookies - great when warmed up a bit in the microwave. As well as the malt chocolate brownies, so addictive! Its been a long time since I've had a cookie from my sister (yup we're related!) but the cowboy cookies are a favorite of mine. Sarah used to help our Grandma make them all the time when we were little.